The Teespring x Google Integration creates a game-changing opportunity for sellers to get their products in front of millions of shoppers. Google Shopping ads can provide Teespring sellers with lower CPCs (cost per conversion) and higher ROI (return on investment). Access to the integration is granted on a case by case basis. You can add your name to the integration waiting list by filling out the form below. Please keep in mind direct sales and your Teespring account history will play a role in determining if you’re eligible for access to this integration. Once you’re granted access you will receive a Google AdWords invitation to the email address associated with your Teespring account. Teespring’s integration with Google is unique because it’s so easy to use—we handle all the heavy lifting like creating and syncing your product feeds and managing your Google Merchant Center account. All you need to do is set up your Google AdWords account and start launching ads! Hassle-free product feeds: You don’t have to deal with the hassle of constantly setting up and syncing product feeds. Whenever you create a new product we’ll automatically add it to the GMC product feed for you. Then Google will review the new products within 3 business days. 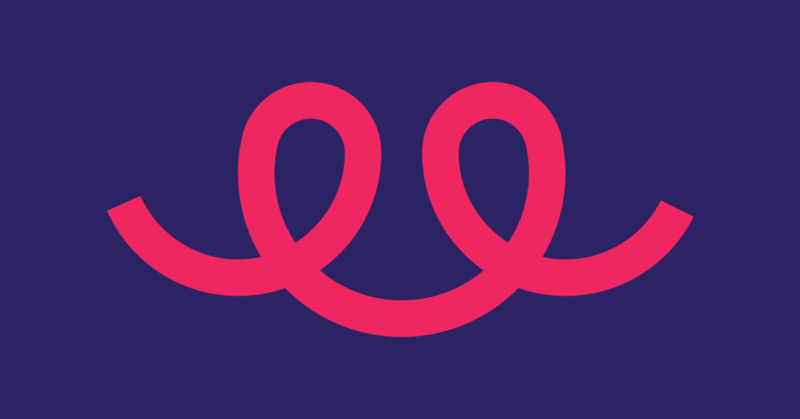 Use your existing URLs: No custom domain required. You’ll be able to send shoppers directly to your Teespring listings without issue. Control your ads from one account: You won’t have to waste time setting up and maintaining multiple accounts to advertise. We’ll create and sync your Google Merchant Center and Google AdWords account for you. All you need to do is add your payment info once we send you the AdWord Account invite! Setting up your AdWords account is easy. Watch the video below to learn how to set up your account once you’ve received the invite via email. 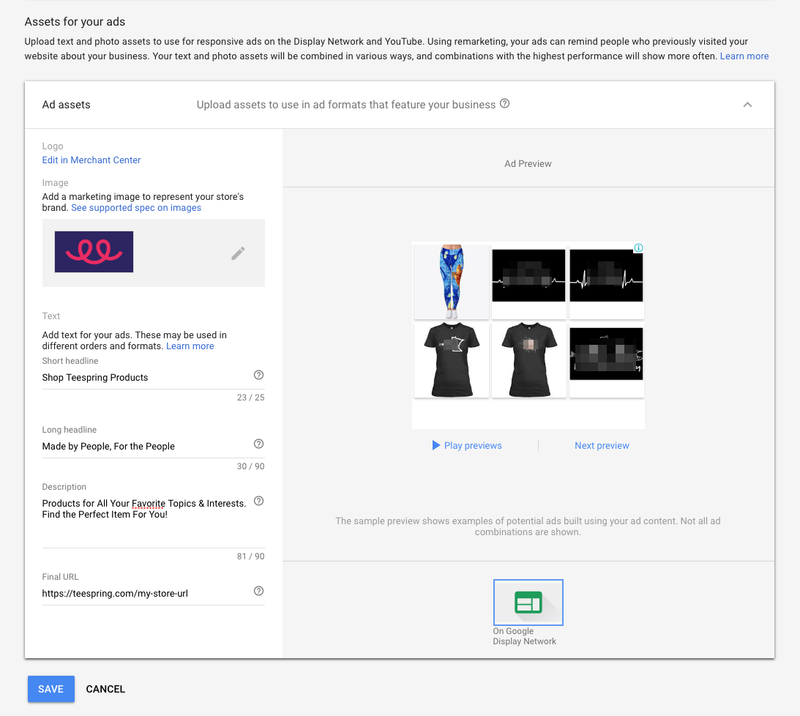 If your Teespring email is not Gmail don’t worry—learn how you can access your new AdWords account here. You’ll notice there are two types of shopping campaigns available as you start creating ads—Smart Shopping and Standard Shopping campaigns. The main difference between the two is the fact that Standard Shopping campaigns rely on specific keywords for optimization and are not entirely fueled by Machine Learning. Standard Shopping campaigns do not offer the ability to maximize conversion value by automating bids and targeting across products and audiences (however Smart Shopping campaigns do). In contrast, Smart Shopping campaigns are automatically triggered by descriptions, titles, etc. from the listings added to your product feed (instead of being limited to specific keywords). Smart Shopping campaigns also use Machine Learning algorithms to identify which products are the closest match to the desired product of a searcher/shopper. Because the product feed uses your listing titles and descriptions it’s important to make sure they are always optimized. Examples of Smart Shopping campaign ad placements—find the right shopper on the right channel at scale! All in all Smart Shopping campaigns simplify campaign management, optimizes your campaigns based on your goals, and extends your reach to shoppers throughout the Google network. This makes them a great advertising option for sellers who are just starting off with Google ads—Google will essentially optimize the ad for you! Please note when you first access your new AdWords account you may need to get 20 conversions (sales) to unlock Smart Shopping. Optimzing your Teespring listings is one of the most effective ways to improve the performance of Google Shopping ads. It’s as simple as updating your listing title and description and we’ll explain exactly what to do (and not do) in the content below. Please note Teespring listings have a limit of 40 characters for titles and 1500 characters for descriptions—so choose your words wisely! When optimizing your listings you’ll want to include keywords and information that will help shoppers discover your products (add words you think shoppers will use to search for your product/design). Make sure to add the most important information within the first 150 characters of your listing description. Describe your design, the design theme, and/or your intended buyer (who is the design for). Incorporate keywords you think a shopper would use while searching for your product. Include the most important information in the first 150 characters of the text. It very important that you do not add the product type in the title. Teespring will automatically add the product type to the feed for you. For example, if you add ‘Unisex T-shirt’ in the title you’ll be wasting valuable characters. Use capitalized letters for emphasis—this looks spammy (i.e. don’t write BEST SHIRT EVER). Include comparisons or details about other products or designs. Don’t include promotional text that isn’t related to the product (shipping info, delivery, price, payment options, etc.). Let’s take a look at some optimized listing examples. You’ll notice that we’ve incorporated more descriptive keywords—specifically ones that a shopper might search for if they’re interested in buying one of these designs. We’ve also added words to describe specific design elements as well as design colors, patterns, etc. Updating your listings is super easy. You can go to the ‘Listings’ section of your Teespring account and edit your live listings manually. Learn more here. The tips described above are not only beneficial for your Google Shopping campaigns, but can also enhance your Boosted Network listing performance too. Maximize your sales across Teespring by updating existing listings and applying these best practices to any new listings you create. There are several ways you can customize your Standard Shopping campaigns including selecting specific Item IDs (i.e. you can choose to advertise specific niches or products). First Click here under “Product Groups” in Google Ads. Select the Standard Shopping campaign you want to customize and click the “+” button. Then you will see all of these different categories for breaking out your feed in Google Ads. Here you can select ‘Item ID’. 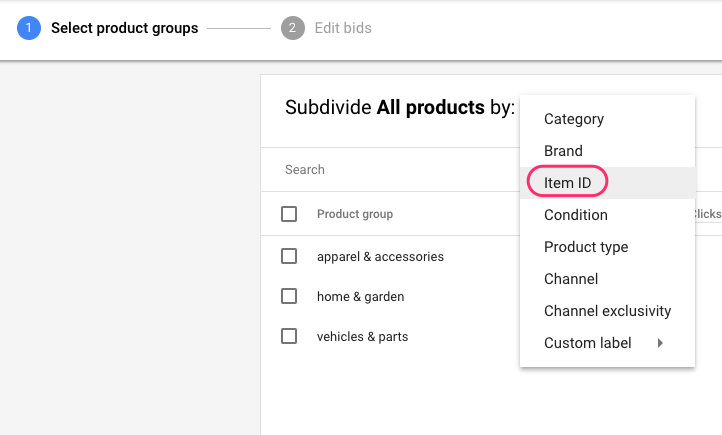 From there, you can increase or decrease bids on certain product groups or choose not to advertise certain product groups at all by setting the bid to $0. Google’s bidding algorithms for Smart Shopping campaigns are designed to give you the highest conversion value (highest profit or sale value) for your ad spend. Google will prioritize your highest value purchases instead of simply driving the highest volume of sales possible (so you’ll get more bang for your buck!). This is why many users can see a 20% higher conversion value compared to Standard Shopping campaigns (for the same amount of ad spend). Smart Shopping campaigns are very effective because they’re fueled by Machine Learning—which makes it possible to automate bidding across intent signals and shopper behavior. Your Smart Shopping campaigns are able to combine insight like search queries, seasonality, device type, location, and ad placement with product categories, prices, basket sizes, and audience lists for you! Essentially you will create the ad and Google will do the work of finding the people who are most likely to convert. It’s all about collecting data and insight. The more data (traffic, clicks, conversions) you collect in your AdWords account the better your campaign performance will be. As your campaigns optimize you should notice the CPC (cost per conversion) decreases while your conversion value increases over time. As you start creating your first ad campaigns there are few things to keep in mind when it comes to Smart Shopping. Please note, at this time (October 2018), product feeds are available for products and buyers located in the United States—we’ll update the community as we add more countries to this offering. Give your campaign time to learn: Normally Smart Shopping campaigns require up to 14 days (learning period) before you’ll start to see conversions ramp up. During this time you’ll want to avoid editing your campaign (i.e. don’t change the budget or other aspects of the ad). That being said, it’s possible you may see ramp-up early on —in this case, you can consider scaling your ad budget. Set a healthy ad budget: Daily ad budget depends on each user. You should select an amount you’re comfortable spending daily for up to 14 days. Keep in mind these ads are not like Facebook ads—you’ll need more than 48 hours to determine if you should scale or kill the ad. Even if you don’t get lots of conversions early on the money you’re investing will be useful—each day the campaign runs the smarter the ad gets based on the data collected. This is why ramp-up can take several days to occur. Wait to start customizing your campaign: Don’t start customizing your Smart Shopping campaigns by product type, product ID, etc. right from the start. Run your first campaign with all products. In the future, you can focus on customizing each shopping campaign by product type for example. Sellers are accustomed to creating ad images and descriptions when using other advertising platforms…but this is not the case with Smart Shopping campaigns! During the campaign creation process, you’ll be asked to create ad assets. Keep in mind your ads will automatically show assets like product images, price, description, etc. pulled directly from the product feed. In the off chance someone visiting teespring.com but doesn’t indicate the specific product they’re interested in they may be shown a ‘generic’ retargeting ad—which is what the assets below are for. Keep in mind it’s possible no one will ever see these assets so don’t sweat too much about this part of the campaign creation process. Here is an example of ad assets that can work for Smart Shopping campaigns. You can adapt the wording to encompass a variety of products or one product type. As you customize your shopping campaigns in the future you can look into replacing these elements with content that relates specifically to your brand, niche, product offering, etc. Final URL: You can enter your store URL here, Teespring URL, or a specific listing URL. Marketing Image: Use the approved image below for your marketing image—just right click and save! Again, you should let your Smart Shopping campaign run for 14 days before evaluating its performance. Unlike Facebook, Google Shopping ads are designed to get you the most value per conversion instead of maximizing clicks or engagement. As your Google Shopping ads become smarter you should notice your conversion value increasing and cost per conversion decreasing. Don’t forget, because you’re selecting ‘sales’ as the goal of your Shopping campaigns this means conversions equal sales. Out of all of the metrics available for analysis, the most important metric is All Conversion Value / Cost. This will indicate your ROI or ROAS (Return on Ad Spend). Conversion value (or All conversion value): Conversion value is the value of the conversion or the total worth of the sale. For example, the Teespring blanket you sold cost $60—this means the conversion value is $60. Smart Shopping campaigns will prioritize your highest value purchases instead of simply driving the highest volume of sales possible (so you’ll get more bang for your buck!). The higher your overall conversion value the better. All Conversion Value / Cost: When looking to assess Return on Ad Spend (ROAS), you will want to assess the total revenue of generated sales (all conversion value) divided by your investment in Google ads. If you spend $10,000 in a week and those ads generate $35,000 of sales, then your ROAS will be 3.5. It’s important to remember that ‘Clicks’ is not the most important metric. You may initially see a decline in your number of clicks. This is expected since the bid strategy for these campaigns reduces bids for clicks that don’t maximize your conversion value. The money you save is then used to bid higher for clicks that are more likely to drive conversion value. For the same reason, your cost per click may fluctuate. 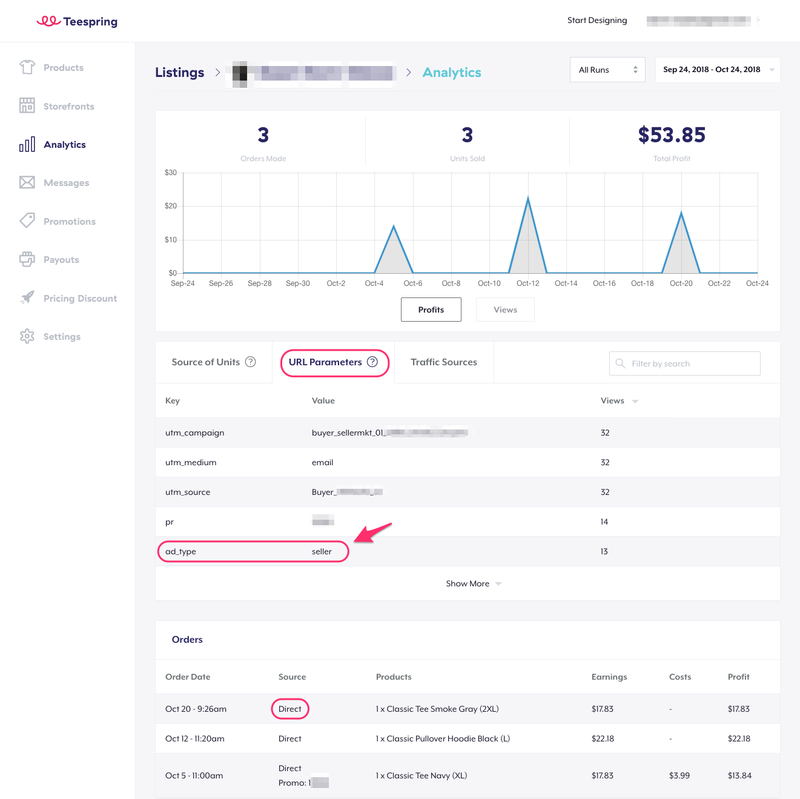 Google Shopping sales will appear as Direct sales within your Teespring Analytics because you are driving these sales through advertising campaigns (just like Facebook ads). You can identify Google Shopping sale views using the ad_type = seller value within the URL Parameters section each listing’s analytics. As mentioned, Google Shopping ads are designed to get you the most value per conversion instead of maximizing clicks or engagement. With Google Shopping, your ad is triggered when people are actively searching for your product, not just while they are scrolling through a feed. Additionally, Google will only count conversions when an ad is actively clicked and a purchase follows after. For example —Facebook (by default) includes View-through Conversions (VTCs) when reporting Return on Ad Cost. So, if a user scrolls through their feed and one pixel is rendered for 10 milliseconds on the screen, Facebook will count this as a view and will take full credit for any conversion that happens after. For example, if a shopper scrolls through their Facebook feed and one pixel of an ad renders on their screen (whether or not they noticed it), then the next morning they go onto Google, search for a product that they want to buy, click on a shopping ad, and buy, then Facebook will assign full credit for that purchase in their reporting. However, on Google, if someone is researching a product online, sees valuable information on your Google shopping ads (price, image, brand, etc.) or on the display network (for example nytimes.com), and then goes straight to your website and buys later on, Google will not take any credit for the sale because they didn’t click on the ad. In this case, your ads likely played a significant role in the sale, but you didn’t have to pay for any of the touch points along the way unless the buyer truly clicked on your ad. Learn more about Smart Shopping campaigns and metrics in the Google Ads Help Center.